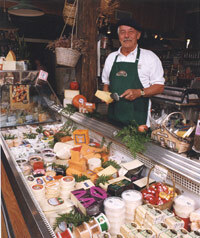 At the heart of Larry's Market is the cheese case, where the finest imported cheeses are displayed. French, Spanish, Italian, Greek, Danish, Swedish, and more. Please call for additional information about our cheese selection. The 2016 Rush Creek Reserve will be available starting on November 14. Call or email to reserve yours! As we are all constantly reminded, there are many choices when considering where to spend our limited money and time. We just wanted to share with you why we think buying cheese at your local cheese shop is the right choice! 1. Grocery stores do not cut-to-order cheese. Most local cheese shops cut all cheese to order. When you buy pre-wrapped cheese from a reach-in cooler at a grocery store, that cheese may have been sitting under plastic for up to 4 weeks. Cheese is a living product, and it degrades quickly. We suggest you try a taste test - compare the flavor of a piece of pre-wrapped cheese to the same cheese cut-to-order at a cheese counter. You will be amazed at the difference. 2. Large chains buy, ship, and handle cheese in bulk. The small pre-wrapped piece of cheese you pick up from a large chain just hasn't gotten as much love as the little wedge from your local counter. 3. Small cheese shops carry higher quality cheese. Not all Parmigiano Regggiano and Goudas, for example, are created equally. Some are mass produced in factories, some are hand made in small batches. Your local cheese shops carry the good stuff, and we can tell you the stories. Try comparing some from different places if you are unsure. 4. True cheesemongers love cheese, know a lot about cheese flavors and pairing, and can tell you stories about your cheese. They can help you pick cheeses to plan a party, find new cheese with specific flavor characteristics, tell you whether cheeses are local, organic, farmstead, thistle rennet, how long they are aged, whether they are pasteurized... And if they don't know the answer, you can be sure that your cheesemonger will immediately try to find out. You are not just buying cheese, you are working with a cheese consultant. 5. You can taste before you buy at your local cheese counter. If you don't like it, try another! 6. Your locally owned and operated cheese shops keep as much money as possible in our local economy. Your local cheese counter carries more local and regional cheese and often buys these directly from the cheesemakers. 7. Price may not be as different as you think, but... Grocery stores and large chains certainly can often offer lower prices because of their lower labor costs (it takes more labor to cut-to-order and maintain cheeses in good health) and their buying power. However, cheese prices are constantly changing based on milk prices, shipping costs, fuel, and feed. It's hard to directly compare prices between shops, especially because all cheese with the same names are not the same quality (see #3). But you will usually find that when comparing most shops, some prices are higher and some lower. 8. Shopping at a local cheese shop is fun. Local cheese shops smell good, and you will frequently find interesting characters hanging around. You hear better stories at your local cheese counter. It's not just shopping, it is entertainment. We think it's worth the trip. We love local cheese counters, that's why we are here! Please support us - we want to be here for a long time! Looking for new and different ways to round out your cheese trays? Larry's has some wonderfully tasty accompaniments for cheese. From Spain- Mittica Date Almond Cake and Fig Almond Cake. Slice these into thin wedges, and serve with aged cheeses like the traditional pairing of Manchego, or try with Pleasant Ridge, Cave Aged Marissa or Brebis. These cakes are made only of dates or figs and Marcona almonds. Also from Spain-Mittica Membrillo, Quince paste. Again a traditional favorite with aged Spanish cheeses, try this with some of our new American originals. From Croatia-Damatia Fig Spreads. Try with crackers and goat cheese, delicious on warmed brie, or make a grilled cheese with chevre and fig spread on sourdough. Available in Original or Fig Orange Spread. Now is the perfect time for fondue and raclette. Larry's has ready made cheese fondue in packages, just heat & serve. Larry's carries Swiss and French Raclette Cheese, and has all the "traditional fixings" for raclette. Red potatoes, French bread, cornichons, pickled onions, sausage, prosciutto, serrano ham or smoked beef. Don't have a fondue pot or raclette machine? Larry's rents both for $7.50/weekend. Send a gift of cheese to your friends, family and clients. Gift packs start at 25.00, shipping exluded. Larry's selection of Artisan Wisconsin Cheeses makes a wonderful gift for any cheese lover. Call for details. Don't know what to give? Larry's has gift certificates available in any denomination over $5.00!